The Hot Rod (ホットロッド, Hotto Roddo?) is an Emblem Heartless that is found in Kingdom Hearts II. Hot Rods are Heartless resembling cartoonish cars that appear in the Timeless River. The Hot Rod resembles a cartoonish version of a real-world car. Its body is primarily blue, and its roof is sky blue with a bent, navy blue antenna on its top. Its four black tires are set rather close together and have grey hubcaps, and its fenders are silver. 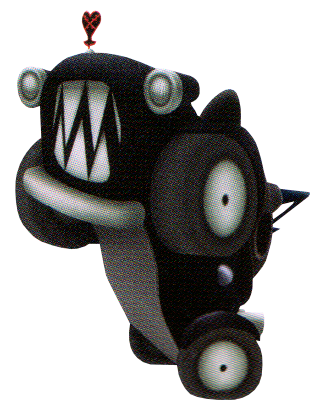 The silver grill of the car acts as the Heartless's sharp-toothed mouth. It also has two headlights with yellow tips that act as its "eyes", though it has actual, glowing yellow eyes set in its black windshield. 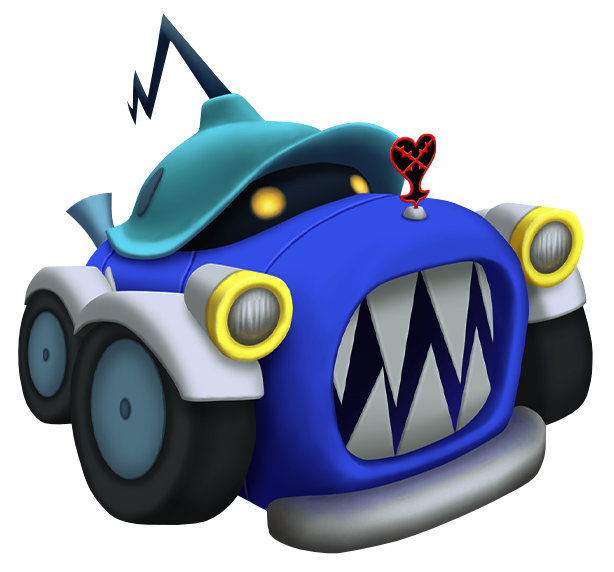 Its Heartless emblem is actually its hood ornament. Like all Heartless, it takes on a monochromatic coloration in the Timeless River. In Kingdom Hearts II Final Mix, the Hot Rod's body, roof, and antenna are all black, its fender, underside, and headlights are white, and its tires are dark grey with white hubcaps. This makes it strongly resemble its form in the Timeless River, the only difference being that its Heartless emblem is still in color. A "hot rod" is a car modified to run faster, particularly pre-1960s models. This references the Hot Rod's resemblance to a car, its tendency to damage opponents by driving at high speeds, as well as the early 1900s theme of the Timeless River, the only world it normally appears in. Hot Rods attack with their tires until a good fraction of their HP is depleted. Afterwards, they go berserk and attempt to repeatedly and rapidly mow down Sora (paying little attention to Donald Duck and Goofy). Hot Rods are invincible to all physical attacks while charging, except for Counterattack. In all cases, immediately Guard when it attacks, then follow with Counterattack to stagger it. Alternatively, it is vulnerable to magic, especially Thunder and Reflect magic. A well-timed Reflega can also be useful. A Hot Rod as it appears in Timeless River. This page was last edited on 6 September 2018, at 21:50.